It’s undeniable that the Apple III hardware had some kind of serious problem, but in 2007 the original case co-designer, Jerry Manock, refuted the case design flaw charges and set the record straight, partially absolving Steve Jobs. Manock proved with various tests that the Apple III unit actually adequately dissipated the internal heat and explained that the problem was caused by the way Apple designed and manufactured the logic board. In some places the traces were too close and there were unwanted microscopic lines of solder, which were the culprit of the hardware mishaps. The problem was solved in December 1983, when Apple launched a “Plus” version of the Apple III with a new and improved logic board circuitry. Alas, it was too late. The computer had already been labeled as an unreliable product and was retired from the market the following April, after disappointing total sales of 120000 units (which, by the way, is still 20000 more than the Lisa ever managed to sell). The Apple III was rightly labeled a fiasco for its technical problems, but it failed on the market because it was not a well-thought-out product. It was doomed from the start by being costly, limited and uncompetitive. One of its bigger problems was the availability of software. 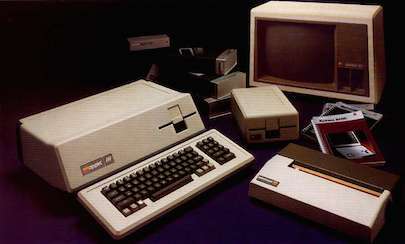 The compatibility with Apple II’s large software offer was programmatically hobbled to avoid hurting sales of the older computer. Hence the Apple III could run only very old and simple applications, and specific software, which was supposed to take advantage of the new capabilities, was very scarce. The Apple II, which cost less than half, looked like a much smarter choice. Also, 1981 saw the introduction of the IBM PC, and the professional market by then was already moving towards 16 and 32 bits CPUs. From a purely technical point of view, an 8 bit computer as the Apple III didn’t really stand a chance. The picture, taken from a 1981 promotional leaflet, is “courtesy of Apple”.